Preheat the oven to 170C or 150C fan-forced. Brush a 1.5-litre capacity ovenproof dish with the extra melted butter to grease. Place the dish on a baking tray lined with baking paper. Sift together the flour and cocoa powder into a medium bowl. Add the sugar and stir to combine evenly. Put the milk, melted butter and egg in a separate medium bowl and use a fork to whisk until well combined. Add to the flour mixture and use a wooden spoon to mix until smooth and well combined. Pour the batter into the greased dish and use the back of a metal spoon to smooth the surface. To make the chocolate sauce, combine the sugar and cocoa powder. Sprinkle evenly over the surface of the batter in the dish. Gradually and carefully pour the boiling water evenly over the sugar and cocoa. Bake in the preheated oven for 30 to 35 minutes or until a cake-like topping forms over the top of a chocolate sauce. If you insert a skewer halfway down in the centre of the pudding it will come out clean when ready. Remove the pudding from the oven and leave to stand for five minutes to settle before sprinkling with icing sugar, if desired. Serve with ice-cream or cream. 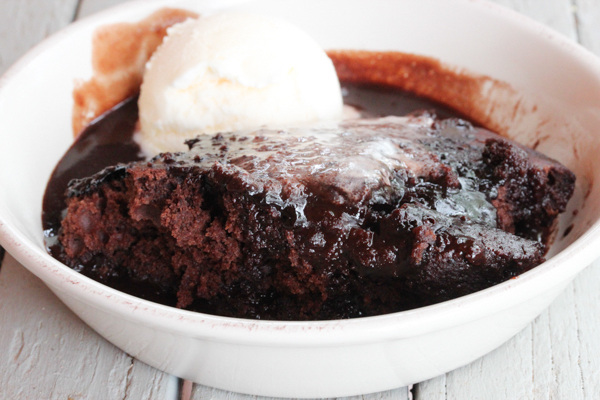 Double chocolate self-saucing pudding – add 100g chopped dark or milk chocolate with the sugar. Chocolate & hazelnut self-saucing pudding – add 60g coarsely chopped toasted and skinned hazelnuts with the sugar. 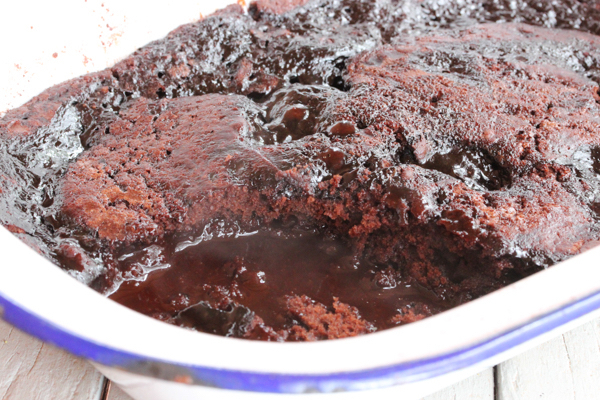 Individual chocolate self-saucing puddings – bake the mixture in six 185ml ovenproof dishes or ramekins or 250ml recycled jam jars. Bake at 170C or 150C fan-forced for 20 to 25 minutes.